Masseria Montenapoleone is set in natural surroundings and lies on a rocky settlement in the midst of enchanting centuries-old olive trees in the countryside close to Fasano, a small town located about 8 km away. 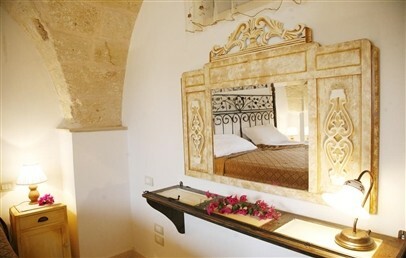 The farmhouse, a mere 5 km from the sea, is the ideal starting point for visiting the region, enjoying the beaches of Salento and the wonders of the Itria Valley. Bari airport is approx. 80 km (55 mns drive) away and Brindisi airport approx. 40 km. 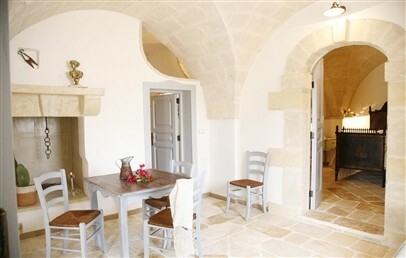 A fortified farmhouse dating back to the 1600s with traditional rooms and suites surrounded by greenery and views of the sea. Passing though reception, the room opens up into a spacious portico that contains an internal patio, once the farmhouse’s courtyard from where the owner’s dwellings and the work rooms like the granary and the olive press branched off. 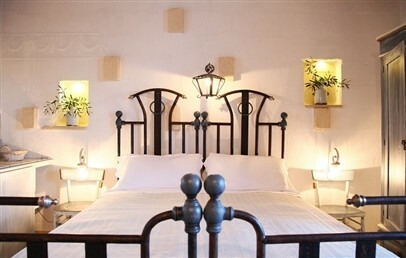 The rural feeling is given a simple elegance with furnishings from the past restored in a sustainable manner. Walking on the ancient paving you have the sensation of floating on decorated rugs. Exploring the hidden gardens, you will come across permanent modern art installations created using ancient rural tools. 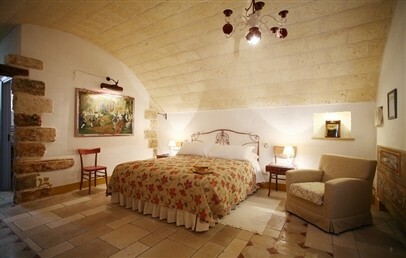 Each one of the 19 rooms and suites at Masseria Montenapoleone is unique. 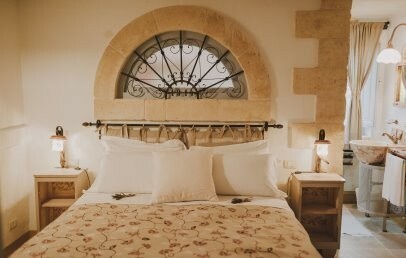 The techniques and materials used to restore the decorative elements express our love of tradition fused with a desire for originality: shoe racks made from old shutters, rudimentary agricultural tools transformed into furniture, with antique stamps, wooden doors and turn-of-the-century iron beds. All rooms have a coiffeuse – the corner in which the women of the farm used to fix their hair and make-up. Complimentary Wi-Fi connection. 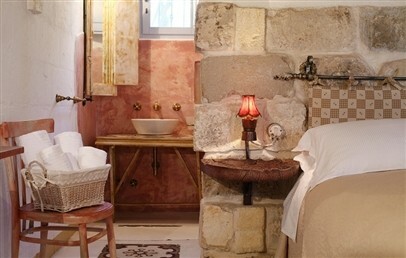 All rooms have an en-suite bathroom with shower. Daily supplement for a crib is € 15.00. 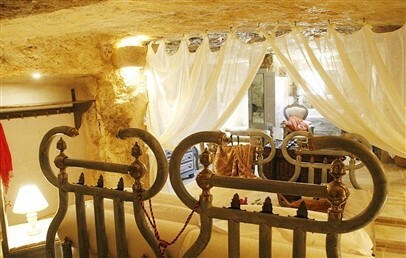 Romantic Suite – formerly an ancient 54 sqm cavern, it has been baptised the Angels’ Grotto. Superior Suite – very spacious and ideal for families, these suites are split into two rooms and can accommodate up to 5 guests. External entrance and balcony with sea view. 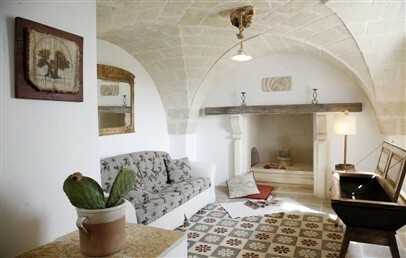 The superior suite “Il Rifugio del Pastore” (The Shepherd’s Haven) is the only room in the Masseria that allows small animals (upon request and payment of an additional fee). Junior Suite – formerly the stables, they have a living room and external entrance from the garden. They can accommodate up to 4 guests. 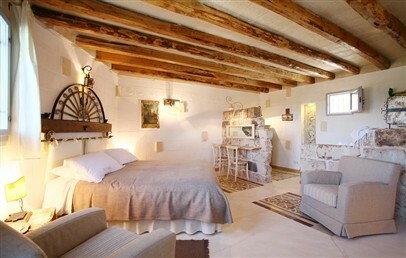 Rustic Room – eight spacious rooms, formerly the lodgings of the farm’s workers, furnished in rustic-chic style. Family Suite – “La Colombaia” (The Dovecote) on the first floor offers two double bedrooms and two bathrooms, a small terrace with sea view and a living room that can accommodate up to two guests. Maximum guests are 6 people. Family Superior Suite – 2 connecting superior suites located on the ground floor. With two bedrooms, two private external gardens and two living rooms, this is a private annex inside the farm that can accommodate up to 8 people. Separate beds are available on request and a supplement of € 15 per overnight will be charged. They are available in the Family Suite and in some Superior Suite, Junior Suite and Rustic Room. The stunning beaches of Salento are just a few kilometres from Masseria Montenapoleone. Towards the north you will find the beaches of Capitolo and Savelletri, while to the south you will come across Torre dell’Orso, San Foca, Otranto and Baia dei Turchi. Guests who are prepared to venture a bit further afield will not regret it once they reach the Maldives of Salento or, continuing along the Ionian coast, the beaches of Gallipoli, Porto Selvaggio, Porto Cesareo and Punta Prosciutto. “La Stalla”, the former stables, is an oasis in which you can enjoy a traditional Pugliese breakfast of cakes, fruit and home-made jams with cold cuts and local cheeses. “La Falegnameria” (open seasonally) is where guests can discover the authentic flavours of the products grown in our own organic gardens. The dishes we serve are an expression of our desire to tell the story of the red earth of Puglia through unique food pairings. When the weather is mild, guests can enjoy lunch and dinner at the poolside, enjoying the sparkling reflections in its crystal surface – a moment of unmissable conviviality. The Masseria’s garden offers a whole host of spots where guests can lie back and relax in close contact with nature: guests can pick sweet figs or fruit from the citrus groves and use them to prepare a freshly-squeezed juice, and relax in the shade of ancient olive trees, almond groves or the open air lounge area. Masseria Montenapoleone offers guests the use of a communal kitchen, a place to socialise and prepare your own lunch or dinner as desired. The pool, perched on a cliff overlooking the Adriatic Sea, is suitable for children. There are countless tailored activities on offer: cookery classes, wine tasting, home-made oil tasting, grape and olive harvest experiences, bicycle tours, Vespa tours, archery, horse-riding. Please note: Bed linen and towels are changed every three days (more frequent changes available upon request and at an extra cost). 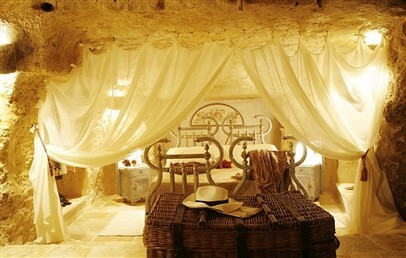 The suite, renamed the Angels’ Grotto, was formerly a 54 sqm cavern. Bathroom with shower. 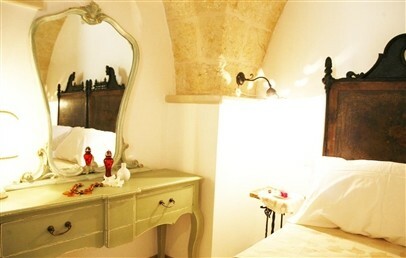 Very spacious, these suites are split into two rooms and can accommodate up to 5 guests. They offer an external entrance and a balcony/veranda with sea view or garden view. Bathroom with shower. In some rooms are available single beds, on request and a supplement of € 15 per overnight will be charged. 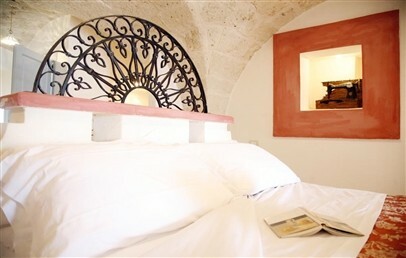 Elegant and comfortable, junior suites have a living room and external entrance from the garden. They can accommodate up to 4 guests. Bathroom with shower. In some rooms are available single beds, on request and a supplement of € 15 per overnight will be charged. 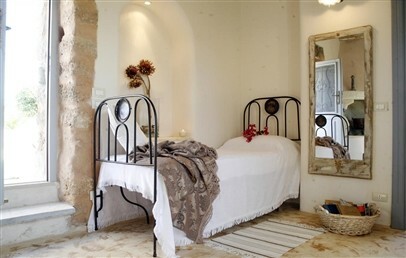 Spacious suites decorated in a rustic-chic style with unique details in each room. One very comfortable room with an external entrance from the garden. Bathroom with shower. In some rooms are available single beds, on request and a supplement of € 15 per overnight will be charged. Located on the ground or first floor, they consist of two bedrooms, two bathrooms and one or two living rooms. Some with sea/garden view and outdoor space. Possibility of accommodating up to 5/7 people. 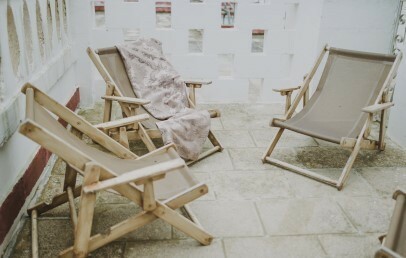 Separate beds are available on request and with an extra charge of € 15 per night. 2 connected superior suites located on the ground floor. With two bedrooms, two private external gardens and two living rooms, this is a private annex inside the farm that can accommodate up to 8 people.